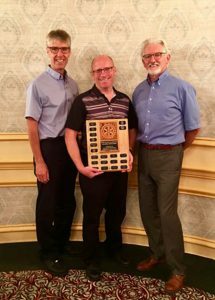 The Rotary Club of Hillsborough recently presented electrician and Holland College instructor Ray Murphy with the Vocational Services Award. Mr. Murphy received a bachelor’s degree with a major in political science in 1994 and graduated from Holland College’s Construction Electrical program in 1998. In 2002, he received the Construction Electrical Interprovincial Red Seal, an Industrial Electrical Interprovincial Red Seal in 2004, and his electrical contractor’s license in 2006. He has been an instructor in Holland College’s electrical programs since 2007, currently teaching in the Industrial Electrical and Construction Electrical programs on the college’s Summerside Waterfront Campus. Imparting his knowledge and expertise to ensure that his students are fully prepared to enter the workforce has earned him a reputation for excellence among his students and his peers. In addition to his responsibilities at the college, Mr. Murphy coordinates and hosts province-wide skill competitions at the secondary and post-secondary levels, encouraging students to consider a career in the trades. Mr. Murphy also volunteers in the community. A volunteer fire fighter for the New Glasgow Fire Department for the past 15 years, he has also been a 4-H leader, a life and surf guard, and is, among other things, a volunteer for the Red Cross Disaster Response Team. Grant Canvin, a member of the Hillsborough Rotary Club and a vice president at Holland College, said Mr. Murphy’s contributions not only to the college, but to his community, make him a worthy recipient of the Vocational Services Award.